La Niña is here. But unlike the El Niño that preceded it, this climate event is expected to be weak and short-lived, the National Oceanic and Atmospheric Administration said Thursday. But that doesn’t mean the U.S. won’t see some of the typical impacts of a La Niña; forecasters expect it to tilt the odds in favor of warmer, drier conditions across the already drought-stricken southern portions of the country and wetter, cooler conditions across some of the northern regions. How La Niña influences weather conditions over the U.S. The weak La Niña is likely to contribute to persisting or developing drought across much of the southern U.S. this winter,” Mike Halpert, deputy director of NOAA’s Climate Prediction Center, said in a statement. La Niña and El Niño are opposite phases of a larger climate cycle called the El Niño-Southern Oscillation. While El Niño features warmer-than-normal waters in the eastern and central tropical Pacific and weakened trade winds, La Niña features colder waters and intensified trade winds. These shifts change where heat is pumped into the tropical atmosphere, which has knock-on effects throughout the global atmosphere, impacting weather conditions thousands of miles away, including in the U.S. In particular, El Niño tends to favor cooler, wetter conditions across the southern tier of the U.S., while La Niña flips the script and favors warmer and drier weather there. Drought conditions already stretch from Southern California to northern New Mexico and from eastern Texas and Oklahoma into the western Carolinas. 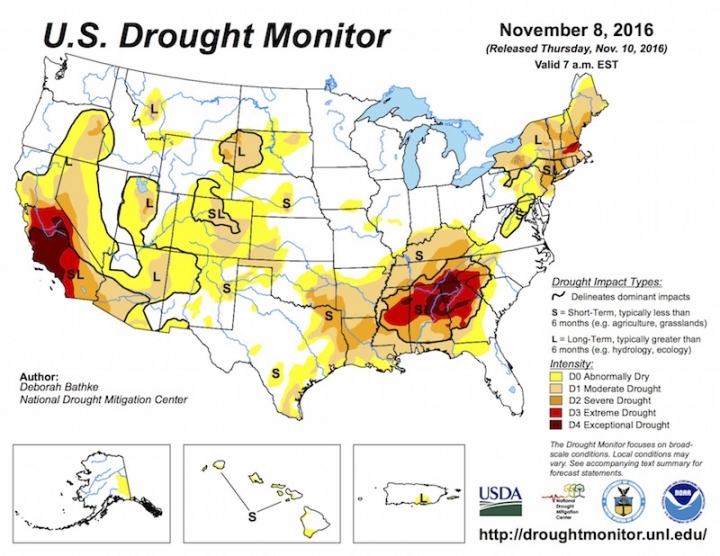 The most intense drought—reaching the two highest categories on the U.S. Drought Monitor—is in central and southern California and northern Alabama and Georgia. In their winter outlook, NOAA forecasters already projected expanding and intensifying drought in these areas, and in a press teleconference, Halpert said he didn’t expect that outlook to change much when it is updated next week. Drought conditions across the U.S. as of Nov. 8, 2016. Outside of the South, La Niña tends to bring wetter conditions in the Pacific Northwest and the Midwest and cooler temperatures in the Northern Plains. While La Niña tips the odds in favor of certain conditions, it doesn’t mean that periods of colder, stormy weather can’t occur in the South or warmer weather in the north, as other climate cycles and factors impact U.S. weather. One clear example of this was the failed wet winter in Southern California this past year, despite one of the strongest El Niños on record. El Niño and La Niña are not the only things that impact our climate, Halpert said. This La Niña has been somewhat tricky to forecast, with NOAA issuing a watch in April, then rescinding it in September, only to bring it back the following month as models wavered over the likelihood of it forming. While many major El Niños have been followed by La Niñas, others, such as the 1982-1983 event, were not. For now the highest probabilities are for this La Niña to continue through the late fall and into winter. Adventure Journal relies on reader support. Please subscribe to our amazing printed quarterly or pick up an issue here.